Taking a spin class soon? We have 6 spin class tips to help you get the most out of the class. Spin classes are quickly becoming one of our most popular classes at BH Live Active, with over 140 a week across our Bournemouth, Poole and Portsmouth centres. If you have a busy lifestyle, these 30 to 45 minute classes are perfect. With the right nutritional balance, spin classes can have some really positive effects on the body in a short space of time. 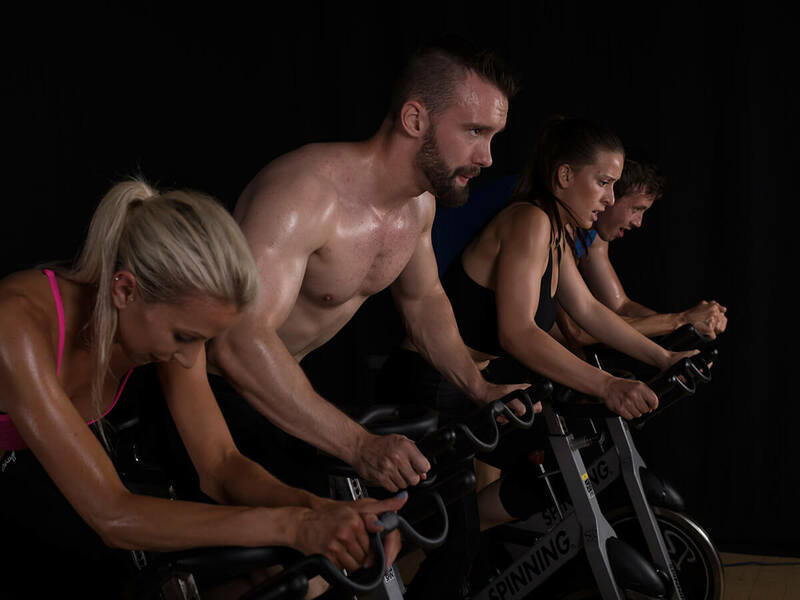 If you are new to spinning or it’s something you have been doing for a while, here are 6 spin class tips to maximise the benefits of spinning in this low impact, sweat inducing, fat shredding, leg building and lung busting class! Position is key on the spin bike. Having the correct positioning will lead to an even workout across your legs, glutes and core muscles. 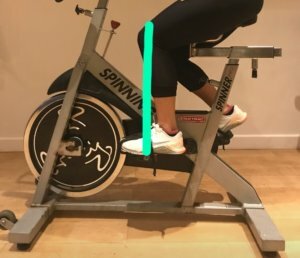 Here are 3 spin class tips that should put you in the optimal position to put out the most power! Set the seat post up high enough that, when you place your heel on the pedal you have a straight leg. When you put your foot in the pedal, you should be able to extend your leg without locking out. Adjust the seat by one pin either way for comfort. Once your foot is in the pedal, get to the 3 o’clock position. If you look over your knee cap, there should be a straight line from the middle of the knee cap down to the middle of the pedal. If you need to, you can adjust the seat slider to achieve this. Almost there, now adjust the handle bars up or down to create a 90-degree angle with your arms and torso. Relax your elbows and shoulders relaxed. Cycling shoes will allow you to clip into the pedals and create a dragging motion at the bottom of your pedal stroke. This will help your hamstrings, calves and hip flexors to activate properly and avoid the “piston like” motion of your quads, causing knee pain and unnecessary tightens through the hips. Remember, more muscles working + more energy used = more calories burnt! 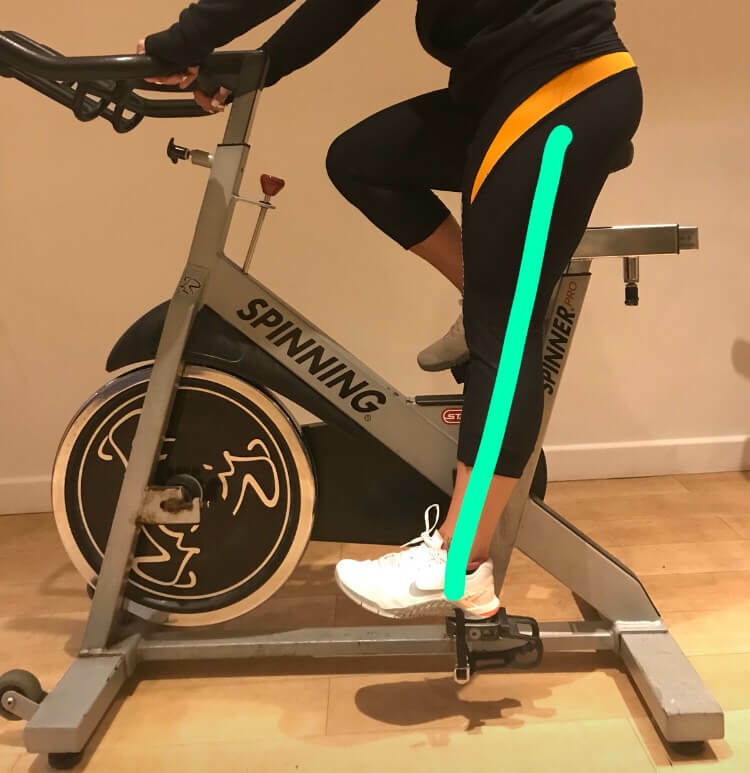 For any of you that are concerned how to clip in and out, your instructor will be more than happy to help you at the beginning of the spin class. Recruiting your core muscles will help you spin more efficiently. Your feet and legs can get really tired during a spin class, but engaging your core for each stroke will increase your stamina. Moving in a more controlled manner will force you to use more muscles to propel your feet. When sprinting it is important to lock in your hips and squeeze your thighs. Place your shoulders right above your wrists to encourage you to hold your body weight, even when you are tired. If you are spinning for social benefits, meeting new people or being in a positive environment, then tracking your output probably isn’t your main priority. 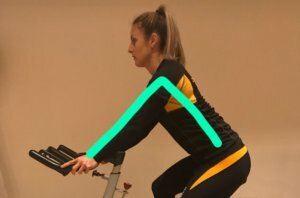 However, if you are looking to lose weight, increase your aerobic fitness or train for a competition then a heart rate monitor can be useful. In order to set yourself a realistic goal, you need to know your current fitness level. Using a heart rate monitor such as MyZone will allow you to see progression and help keep you focused with your training. You can push yourself to meet a specific goal rather than just feeling like you’re working. It’s often easy to grind away on those pedals but feel like you’re seeing no progression. A MyZone belt can show you that there is progress being made. Unfortunately, just being in the spin room isn’t enough to hit your goals. As soon as you get on the bike, find your biting point where you start to feel the resistance of the bike. From there, if your instructor says put a half turn on, you guessed it, put a proper half turn on. The session isn’t supposed to be easy! If you find that a turn is really slowing your legs down and your instructor is aiming to get you to sprint then take it back off, but no more. Stay as close to the instructions as you feel you can. 6) Look after the bike – what can you do? The last of our spin class tips for you! The hard work normally means you’re dripping sweat on the bike for 30 minutes. Sweat can get down into the bike and it will start to rust the bike, so lengthening the adjustable positions will let the bike breathe and stop any sweat from sitting and rusting. Loosening the handles will release the tension and this will help with any future wobbling when trying to tighten the handles up. If you need further advice on any of these tips, please don’t hesitate to ask your spin instructor before the class starts.